Chicago’s art world is a think tank and a real focus of the city. With all the wonderful local artists, the legacy of the past, art schools, and terrific galleries, as well as museums of every scale, it is a genuinely open place to have great conversations and experiences. Ali Gass (Photo by Jean Lachat). 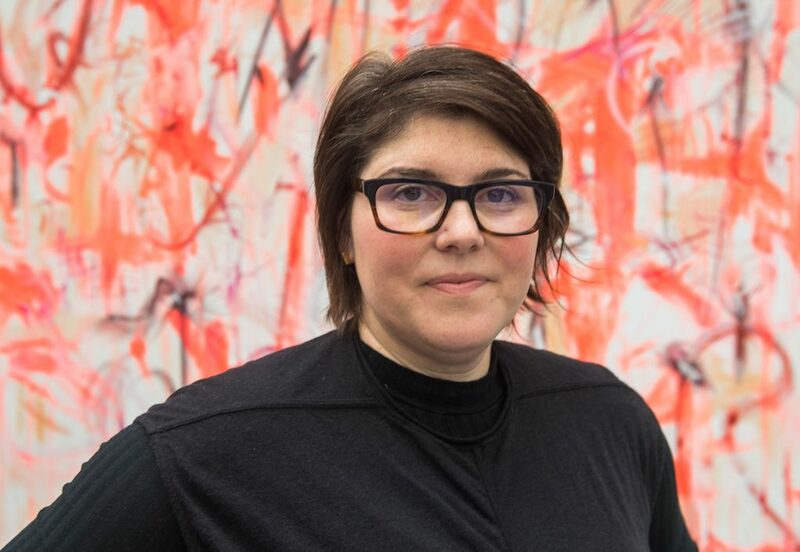 Visiting the vibrant Ali Gass, who came to the Smart Museum in June from Stanford’s Cantor Art Center, it is clear that her promises to shake things up at the Smart will come to pass, and in wonderfully collaborative ways. Included in a past New York Times listing of The New Guard of Curators, Ali is putting her stamp on the Smart. Recent visitors not only are feasting on her first exhibition Welcome Blanket, a crowd-sourced artistic platform created by knitters, weavers, and quilters to reflect upon the immigration crisis, but also the way she is making the museum more object-based. 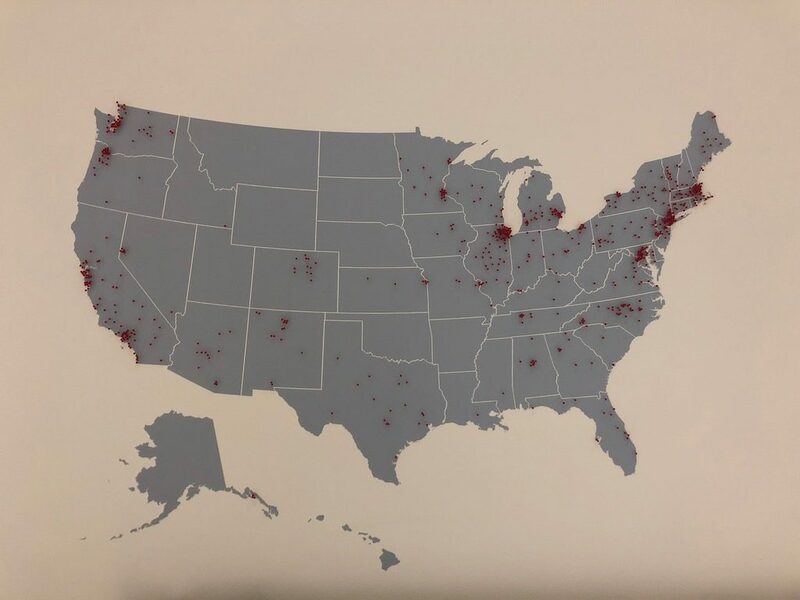 A map depicts participants in the Welcome Blanket project. 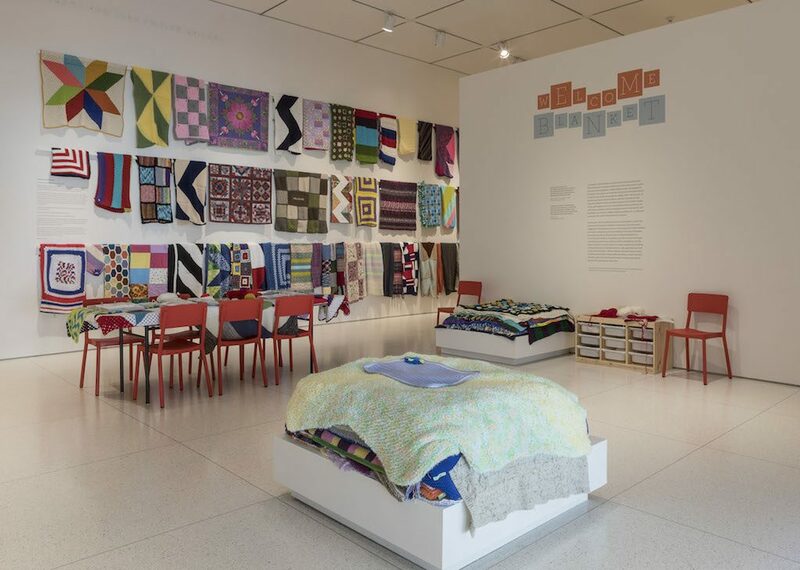 Installation view of the growing Welcome Blanket project at the Smart Museum of Art. Walking into the Smart, you find the recent installation by Southside artist and Sweetwater Foundation Executive Director, Emmanuel Pratt, reaching out into the lobby and café to depict a formerly abandoned home with a functional front porch. 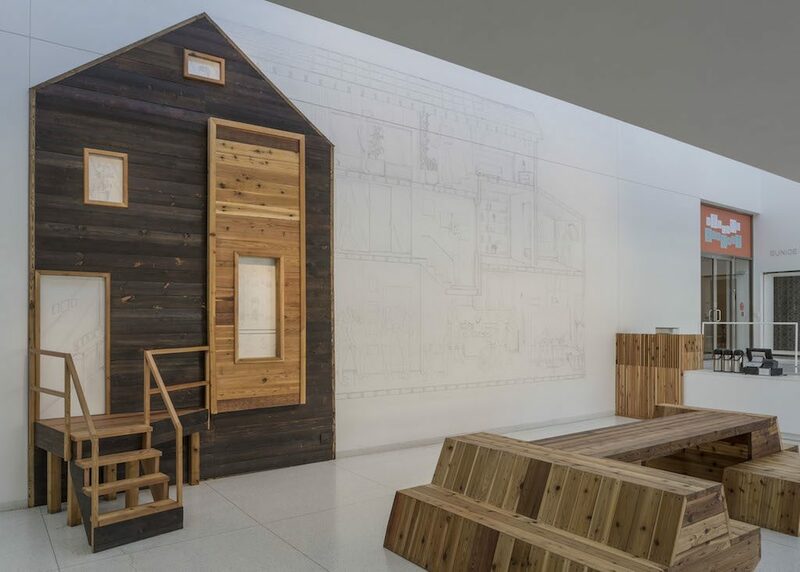 View of Emmanuel Pratt’s site-specific Threshold installation Radical [Re]Constructions at the Smart Museum of Art. Photo by Michael Tropea. 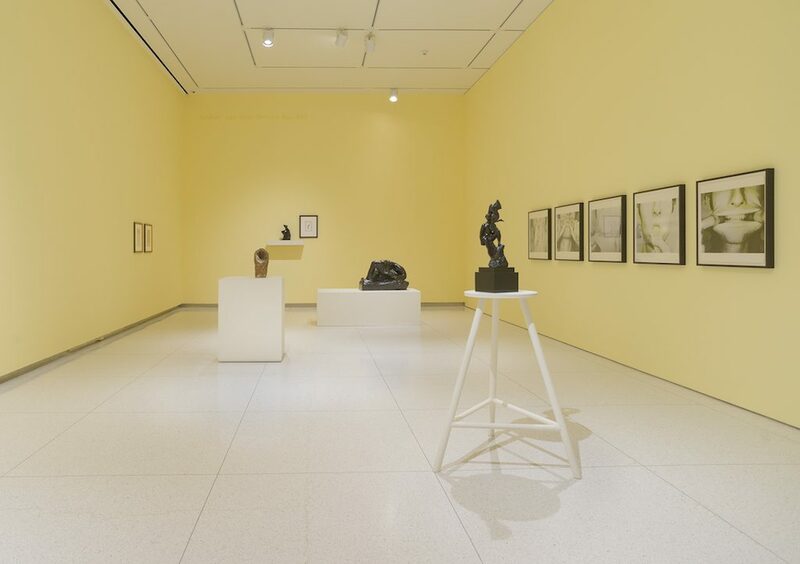 Installation view of Conversations with the Collection: Conversations with the Collection: Building/Environments. Photo by Michael Tropea. Over tea in the Smart lobby (which she is redesigning), Ali answered our most pressing questions. The mother of two young Chicago Laboratory School students, she has loved settling into Hyde Park, exploring nearby galleries and artist studios, and bringing the community into the museum. Tell us about the Smart’s collections and what you would like to add them. We are known for our millennia-old Asian art, modern and contemporary masterpieces, as well as our rich European collection. We would love for works from the African Diaspora to make it into our narrative and to build the diversity of many identity groups. We want to think more broadly about where we should be going. 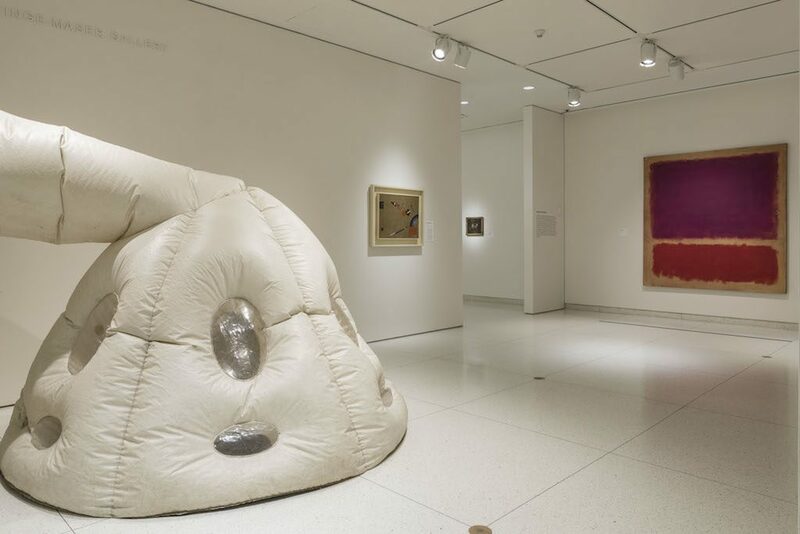 Installation view of The Hysterical Material at the Smart Museum of Art. Photo by Aron Gent. What exhibitions are you planning? In early 2018 we will present Solidary and Solitary, a collection of the San Francisco philanthropist Pamela Joyner. 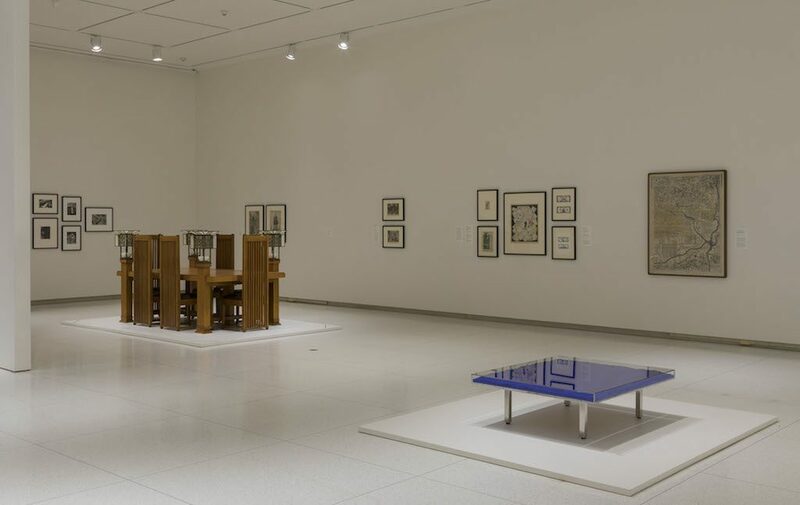 It features works by African Americans and artists of the African diaspora from the 1940s to the present. Joyner, who is originally from Hyde Park, has a very intentional approach to correcting the canon of collecting. In May of 2019 we will present Allure of Matter, a show of contemporary Asian art. We are working with Wu Hung, University of Chicago’s preeminent specialist in this field. It will feature Thai artist Tang Chang and will be the first time his work has shown in the US. What is unique about a university museum? Many universities across the country have significant museums, and Harvard, Yale, and others were founded with them. Most are free to the public and intend to stay free. The Smart’s collection totals over 15,000 works of art stored nearby so that they can easily be pulled out for students. Faculty members often write labels for the works in the show, and academic engagement is key to all the Smart does. Furniture and works on paper co-mingle at the Smart. Photo by Michael Tropea. At Stanford you were chief curator. How has your job description changed with the move to the Midwest? I was a curator of contemporary art for a long time, and I am delighted now to be able to shape the arc of the Smart. We want to build our public education programs, tell the whole narrative of who we are, and, of course, find donors and members. I want to be out in the community, telling our story. It isn’t just members of our university community who are walking through our doors but school and other groups are constants. We have an active docent program as well. You received your PhD from New York University in 19th century art. Do you have a favorite artist from that period? I have always loved Manet. The paint is so thick and luscious that it almost seems that it is still wet. I also like the contemporary LA artist Mark Bradford. Is there a work in the Smart collection that particularly speaks to you? Our Rothko. When the world outside might fall apart, I think I would just look at it. 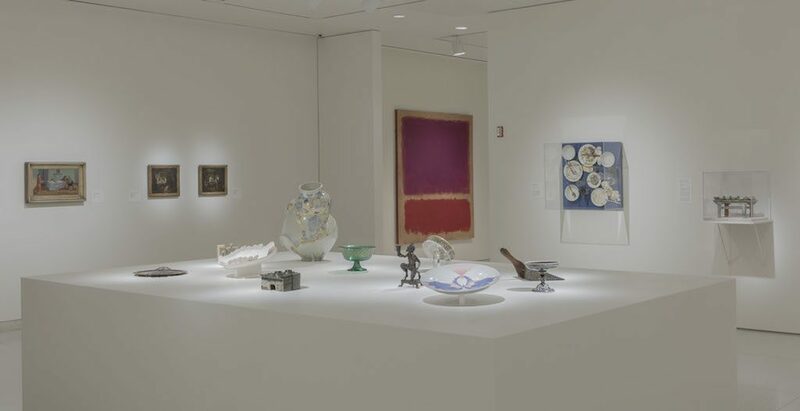 That vibrant Rothko, at right. Photo by Michael Tropea. For more information about the Smart Museum, visit smartmuseum.uchicago.edu. This entry was posted in Guest Stars on November 19, 2017 by Kay Whitfield. COPYRIGHT © Classic Chicago Magazine.